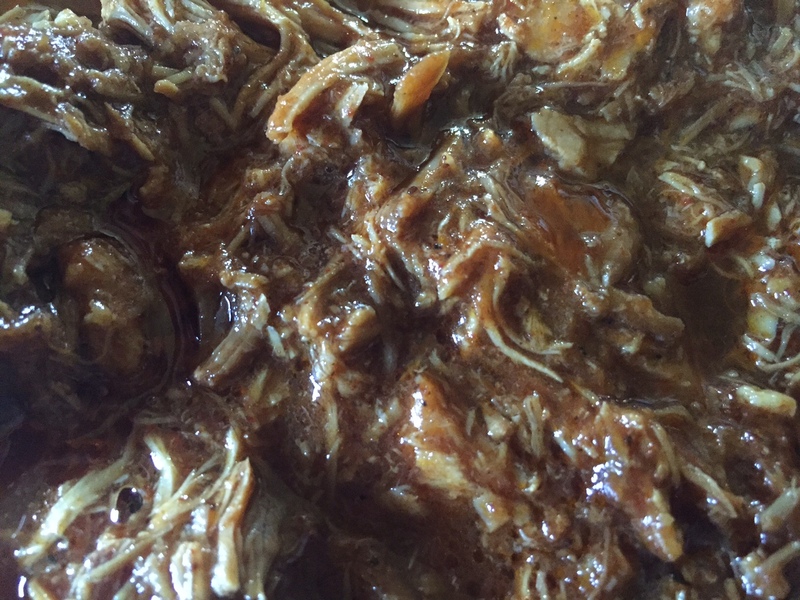 BBQ Chicken – Gina Diamond's Flower Co.
August 3, 2015, posted by Gina – For years I have made BBQ in the crockpot because it is so easy and so good. A few years ago a friend made BBQ for my family after I had surgery and everyone really loved it. I asked for the recipe and discovered that it was chicken breasts and BBQ sauce. We were all surprised as we all thought it was pork. I have made it many, many times since then. This past week I had a meltdown trying to think of what to prepare for dinner. With it being so hot, grilling is not an option and so many comfort type foods just don’t seem appealing. I decided to make the crockpot BBQ chicken. Once in the grocery store I spied some lowly, chicken thighs. I suppose I should not say that because chicken thighs have gained popularity over the past few years. Once home, I cleaned the thighs and topped them with a sprinkle of paprika, chili powder, garlic powder, and pepper and then placed them in the crock pot. A whole bottle of spicy, sweet BBQ sauce with a little liquid smoke mixed in went on top. I cooked the chicken for about 5 hours on high, chopped it and served them on Hawaiian rolls. My family loved this and we have eaten it all weekend. If you need an easy, yummy meal give this a try. Do you have any summer time recipes you’d like to share? Click on the title of this post to expand the comment form which will appear beneath the post. Leave us your recipe or give us your feedback if you try this one.